Trubisky continued to struggle with accuracy but showed the ability (in flashes) to make some nice plays. Overall it was not a good game from him (or any Bear, really). His accuracy seems to be getting worse by the week. I don’t have anything more to add there, besides the fact that he fumbled a snap for the 2nd week in a row. That’s something that will improve with time. Chicago’s offense had two drives that started at midfield or better in the first quarter. Those drives ended in 0 1st downs, 1 punt, and 1 missed field goal. That’s not how you beat good teams. 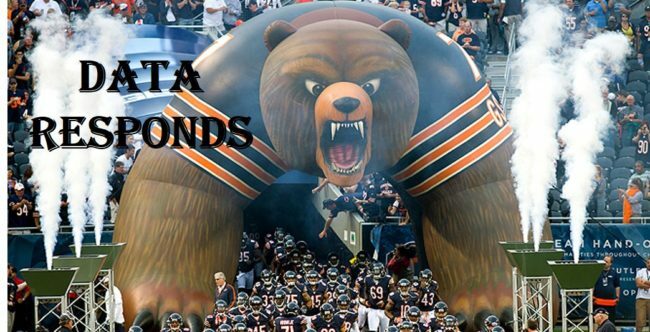 Speaking of 1st downs, the Bears didn’t pick up any of them in the 1st half. Zero. They totaled 17 plays and 33 yards. They did manage to have a bunch of penalties though, so that’s something. Rookie tight end Adam Shaheen whiffed on a block early in the game, and was summarily benched in favor of veteran disappointment Dion Sims. Sims outsnapped Shaheen 14 to 10 in the first half. So much for all of the “Shaheen has earned more snaps” talk from coaches this week. Shaheen got back on the field in the 2nd half and promptly picked up a false start. It was just that kind of day for the Bears. After a nice performance last week, Chicago’s OL was terrible this week. They got absolutely dominated in both the run and pass games. Most of the focus will be elsewhere, but the Bears absolutely lost this game in the trenches on both sides of the ball. WR Dontrelle Inman had the worst game of his young Bears career as well. He dropped a few passes that should have been caught and just stopped running mid-route while the ball was headed towards him. That turned what would have been a perfect pass into what looked like an overthrow. Speaking of terrible wide receiver play, Tre McBride stopped running his route right as it was about to come open on a 4th down. Consequently, Trubisky’s pass went to nowhere instead of being an easy 1st down (and then some). It was a rough day for rookie safety Eddie Jackson, who whiffed on two early tackles that led to big plays by Philadelphia. On the first, running back LeGarrette Blount ran right by him untouched, picking up 35 yards before Adrian Amos forced a fumble. On the 2nd, wide receiver Nelson Agholor ran right around him on a WR screen for a 15 yard touchdown. Later in the first half, he whiffed on Blount again. Tackling was the biggest knock on Jackson coming into the draft, and after mostly being solid this season, it showed up in a big way. Hopefully this was a one-week aberration and not a sign of things to come. Just for good measure, Jackson let an easy pick 6 slip through his fingers in the 2nd half. The ball then deflected to Cre’von LeBlanc, who also dropped the easy interception. It was that kind of day for the Bears. Speaking of Adrian Amos, he gave up a number of easy completions down the field. The Eagles picked on him in this one, and after showing improvement in coverage for most of 2017, he returned to being a liability there, just like he was in 2015 and 2016. Like with Jackson, hopefully this won’t continue to be an issue going forward. Unsurprisingly, the pass rush was nonexistent with Akiem Hicks banged up and Leonard Floyd out. The Bears entered this game minus all four of their starting linebackers from week one (three of whom are out for the year), and it showed. Personnel decisions continued to be a bit baffling. For some reason, Chicago decided to rotate Sherrick McManis in with Cre’von LeBlanc at nickelback, and outside linebacker Sam Acho played far too many snaps instead of younger players capable of more development like Isaiah Irving and Howard Jones. It appears that Acho and Dion Sims are going to be this year’s Tracy Porter and Mitch Unrein, mediocre veterans who continue to play ahead of more talented young players down the stretch of a lost season for no good reason. I guess I get benching LeBlanc, as Philadelphia repeatedly picked on him early in the passing game and he missed an easy sack of QB Carson Wentz. But Sherrick McManis? Outside CBs Prince Amukamara and Kyle Fuller both struggled a bit today as well. It’s hard to cover for an extended period of time when the pass rush can’t even bother the quarterback. One good thing that happened is 2nd year DE Jonathan Bullard played more snaps this week. I didn’t notice him a ton, but he did get a nice sack after chasing Went down from behind and was immediately in the backfield to blow up a running play in the 4th quarter. It was a brutal start to the game for the third phase. On their first punt return, Tarik Cohen let the ball bounce instead of making an easy fair catch, costing the Bears an easy 5 yards. Marcus Cooper also picked up a holding penalty on the return, forcing Chicago to start inside their own 5 yard line. After a three and out, Pat O’Donnell had the whole field to work with and shanked a 34 yard punt. As a result of these three miscues, Philadelphia needed only 44 yards to take the early 7-0 lead. Things didn’t get much better rom there, as new kicker Cairo Santos missed his first field goal attempt as a Bear. In Santos’ defense, it was a 54 yarder, but the kick wasn’t even close. Maybe the Bears should consider going for it on 4th and short (as Philadelphia did successfully twice in the 1st half) instead of trying a long kick. Just for good measure, the Bears added a kick return penalty and partially blocked punt on the same drive in the 2nd quarter. Tarik Cohen has been awful as a return man. He’s indecisive and consistently costs his team yardage. But I want him to continue returning both kickoffs and punts, because the Bears are 3-8 and need to see where they might have answers. Cohen has a great skill set that could translate to a top-shelf return man, but he needs more experience. Whatever they’re doing to coach him up there needs to improve dramatically, though, because he keeps making the same stupid mistakes time after time. We saw what Cohen can be as a return man at the start of the 2nd half, when he used his speed to get through the hole and returned the opening kickoff 39 yards.